Following the top court's decision, the Allahabad High Court also declined to entertain a plea seeking a ban of the Bollywood film. The court verdicts come as a big boost to Sanjay Leela Bhansali who is the director of 'Padmavati'. New Delhi: The Supreme Court today refused to stay the release of Deepika Padukone starrer 'Padmavati' and enquired whether or not the Censor Board has issued the certification. Following the top court's decision, the Allahabad High Court also declined to entertain a plea seeking a ban of the Bollywood film. The Sanjay Leela Bhansali-directed period drama, which also stars Ranveer Singh and Shahid Kapoor in lead roles is due to be released on December 1. The court verdicts come as a big boost to Mr Bhansali in the aftermath of a mob attack in Jaipur and a vandalism incident in Kolhapur during the shooting of the film. An apex court bench headed by Chief Justice Dipak Misra refused to entertain a plea seeking a stay of the release of the film after it enquired at the outset as to whether or not the Censor Board has issued the certification. "Has the film been placed before the Censor Board? Has the Censor Board certified the film," the bench, which also comprised Justices A M Khanwilkar and D Y Chandrachud, asked from the counsel for petitioners. On being intimated that the Central Board of Film Certification (CBFC) was yet to certify the movie, the bench said, "this court should not exercise its writ jurisdiction in such situation". The court also said that there were several guidelines for the CBFC in granting certification to a movie and moreover, there is Film Certification Appellate Tribunal (FCAT) to look into grievances regarding a film. The bench was hearing a plea filed by Siddharajsinh Mahavirsinh Chudasama and 11 others against the film. Besides seeking a stay on the release of the movie, the plea had also sought setting up of a committee of eminent historians to check the veracity of the script to prevent any inaccuracy in portrayal of Rani Padmavati. It was also contended that the film be not allowed to be released till such time any historical inaccuracies in the movie are corrected by the producer and the director. The plea noted that the war-saga was based on the 13th century historical battle between Maharaja Ratan Singh and his army of Mewar and Sultan Alauddin Khilji of Delhi. It claimed that the movie distorted certain historical facts "hurting the sentiments of the Kshatriya community". The trailers show Rani Padmavati doing a 'ghoomar' dance, the plea said, alleging that the depiction of Rani Padmavati in the said dance sequence is contrary to how traditionally 'ghoomar' is performed." 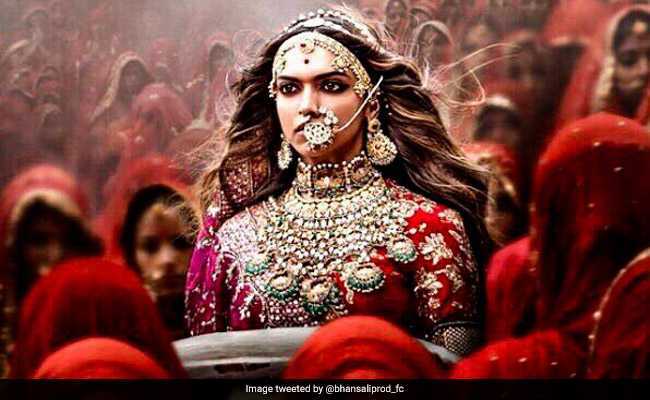 In Lucknow, a division bench of the Allahabad High Court asked a petitioner, seeking a ban on the movie "Padmavati" on the ground that it allegedly propagates the practice of 'Sati', to approach the Censor Board with his plea. Sati is a practice whereby a widow threw herself on to her husband's funeral pyre. The bench comprising justices Vikram Nath and Abdul Moin yesterday refused to interfere in the matter.